Subqueries are queries within queries (nesting queries). There is an outer query and an inner query("the subquery"). correlated subquery does have a dependency. A Subquery can be single-valued(scalar), multivalued or table-valued(table result set)(table expressions). For a scalar subquery to be valid it must return one value. If a scalar subquery returns no value it will return a NULL. A multivalued subquery is a subquery that returns multiple values as a single column. Some predicates such as the IN predicate, operate on a multivalued subqueries. As with any other predicate, you can negate the IN predicate with the NOT logical operator. and cannot be invoked by itself. 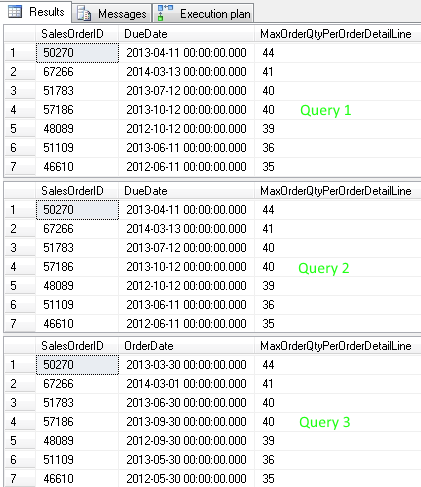 Logical Processing - the subquery is evaluated separately for each outer row looking for a match.